The story of Jesus interacting with the Emmaus disciples after his resurrection provides an outline for what a gospel-centered kids ministry looks like: gospel-centered teaching that points to Jesus in every session, gospel-centered transformation that positions the gospel to change a child's heart and then his or her behavior, and gospel-centered mission where kids join in on the big story of Jesus that continues to unfold. Seven out of ten kids will walk away from church after they turn eighteen. About five will return when they have families of their own. But two will never return. Clearly, something isn’t connecting with our kids. As kids ministry leaders, we need to take a hard look at what we are missing in our kids ministries and provide kids the one thing that will satisfy them and keep them connected to the church—the gospel. Gospel-Centered Kids Ministry also addresses how to communicate with and encourage gospel-centered leaders and parents as part of your ministry. 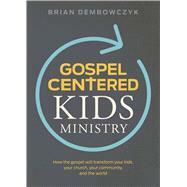 Brian Dembowczyk is the Managing Editor of The Gospel Project, a Bible study curriculum used by over one million people each week, and the author of Gospel-Centered Kids Ministry: How the Gospel Will Transform Your Kids, Your Church, Your Community, and the World. Before beginning work with The Gospel Project at LifeWay Christian Resources, Brian served in local church ministry for seventeen years, primarily in family and discipleship ministries. Brian earned a D.Min. from the New Orleans Baptist Theological Seminary and an M.Div. from the Southern Baptist Theological Seminary in Louisville, Kentucky. He, his wife Tara, and their three children—Joshua, Hannah, and Caleb—live in Murfreesboro, Tennessee.